Playing with energy, creating countless turnovers and connecting on offense combined to be the perfect recipe for the win for the Turkey Valley boys’ basketball team (2-0, 2-0 UIC) over West Central (0-3, 0-2 UIC), 72-39, at home Friday night. The Trojans gave up just eight points in the first quarter while pulling ahead 22-8 over West Central. TV extended its advantage to 42-19 by halftime and never let off the gas, outscoring the visitors 30-20 in the second half. With limited time on the floor, Ethan Leibold topped the scoring chart with 17 points. Freshman Garrett Kurtenbach came off the bench to have a double-double night with 13 points and 10 rebounds. Chipping in nine points each were Seth Huinker and Simon Schmitt. 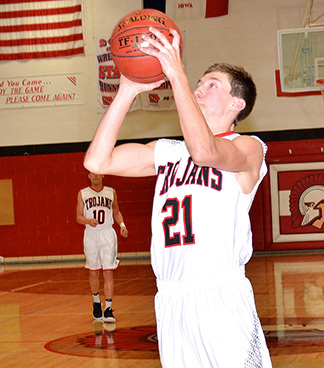 Turkey Valley will have its first road contest of the season tonight (Tuesday, Dec. 4) as the Trojans pack up and head to Central Elkader for a 7:30 p.m. tip-off.